Shoes Shopping - Carolina Domestic 10"
Made in the USA! Leather upper featuresCambrelle® rugged fabric lining which has good moisture wicking capabilities, a heavy duty steel lineman shank and a rubber 1 piece Vibram® outsole. 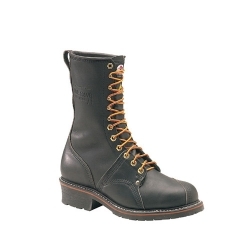 Steel toe meets or exceeds the compression and impact testing rating of 1-75 and will absorb up to 75 lbs. of impact. Features Poron® Permafresh shock absorbing cushioned insoles with anti-bacterial protection. DRYZ® technology, an innovative insole system that absorbs moisture and converts it into a dry gel within the insole of the shoe. As a result, the insole absorbs the moisture from perspiration throughout the day, yet remains dry to the touch.